In the late 1960s the Caribbean Reef Runner was the “one day” boat of every offshore fisherman. It was legendary for its poor weather performance and for its stability. In those days Caribbean licence-built Bertrams in Victoria; the Reef Runner used the Bertram 20 hull. A lot has changed since then, but not that hull. Nor has the enormously high resale value. Caribbean is a conservative company, thinking long and hard before changing anything. 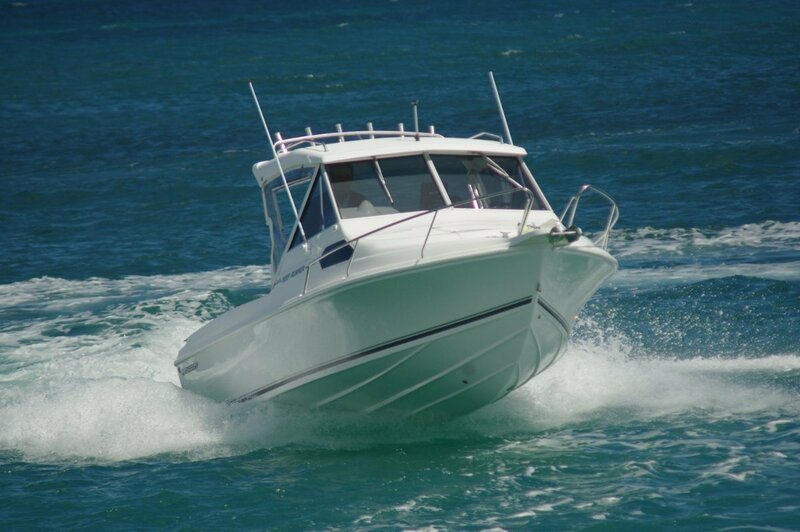 Local agent Mansfield Marine is a family of shipwrights, and they have made intelligent modifications to various Caribbean models – many of which have been later incorporated in production models. 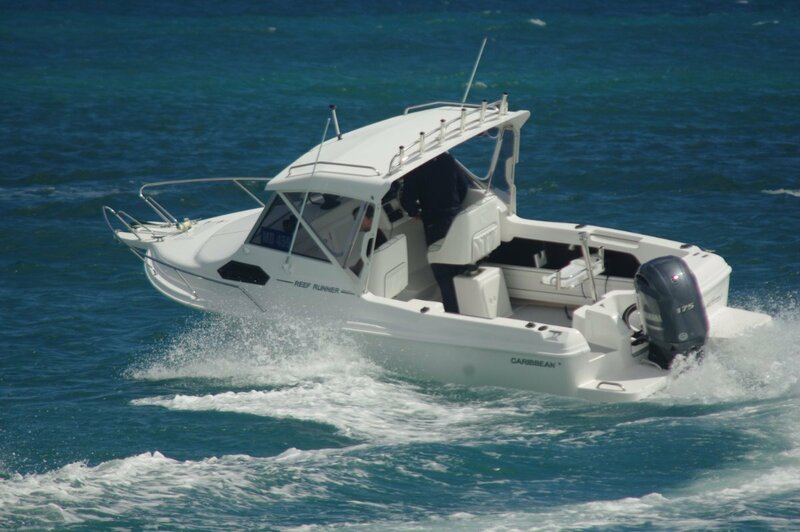 The review Reef Runner has a combination of Caribbean’s own improvements and Mansfield’s. Among these are much bigger marlin boards: useful for boarding or diving platforms, of course, and also providing protection for the motor. A motor that in this case is about 50 percent more powerful than the typical unit on an early 70s Runner. The port board has a transom door ahead of it, and both quarters feature removable seats. A very welcome factory modification has raised the hardtop, something Mansfield used to do themselves. It was long overdue as anyone even slightly over medium height used to stand under it with head cocked to one side. But sitting has much to be said for it in the excellent pedestal swivels provided; the driver’s sitting on a locker, the navigator’s on an icebox that projects to carry a jump seat. 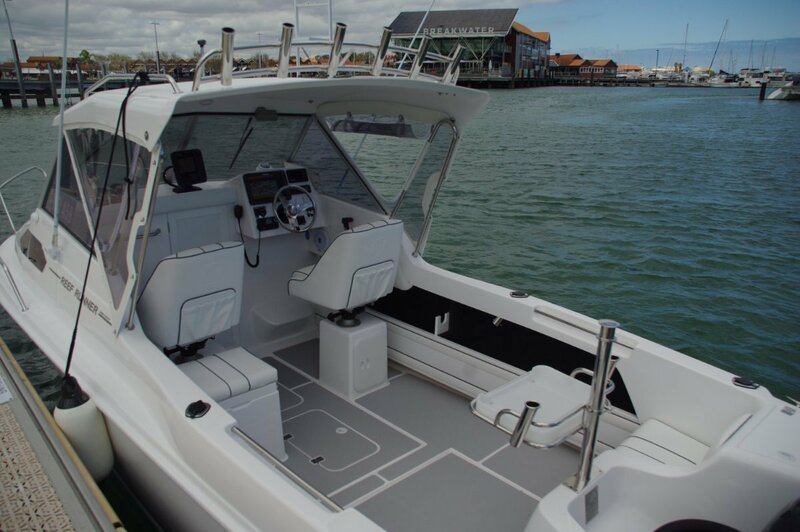 Although the Runner has usually been regarded as primarily a fishing machine, it has the size and fit out to make it a family boat. The fore cabin has adult length V-berths and a flushing toilet. Its rear bulkhead is now in GRP instead of timber and has a lock up door. The cockpit is roomy, so a family overnight could see the kids sleeping in the cabin with mum and dad on air mattresses. But this is still the excellent fishing friend boat it always was. Under the Z-tread deck covering (a foot-friendly synthetic foam material) are two floodable catch or ballast tanks; at the transom is a 30 litre live bait tank. The lined side pockets are enormous, providing horizontal rod stowage as well as room for more gear than most people take afloat. More rods are accommodated in the hardtop’s rocket launchers. The side grab rails are recessed into the side decks to avoid snags, and those decks are raised high enough above the main deck to make anyone feel secure. At the transom is a removable bait board combined with a ski pole – emphasising family use on off days. Runner prices vary greatly as many buyers like to add the extras. The most popular of extras is a power windlass, which is fitted locally. This is drum style, with a drum big enough to take a 90 metre anchor line. The buyer of the review boat, although a family man, is a dedicated angler. His extras list is heavy on top of the range electronics. One standard item on board would be an extra on many boats: twin batteries. Alongside a good fuel gauge this is the greatest get-you-home device you can fit. We had great boating weather on the review day; good in its own way, but not the stuff to reintroduce me to the Runner’s poor weather abilities. We made up for it to some extent by using plenty of throttle. The lusty 175hp Yamaha is a motor the Runner deserves; this boat can use power. The ride was just as I remembered it: first class. As was the manoeuvrability, though this was partly due to the effortless hydraulic steering. Overall enjoyment was enhanced by the deluxe driver’s position. The classy seat set the pace, with wheel and controls falling naturally to the hands, and the gauges and screens to the eyes. Good stability at rest is of course vital in the fishing role – and very acceptable at any other time. The Runner has it. It is due to the excellent original design, which includes the less than typical beam of 2.35 metres. A classic design which is also bang up to date.